News ► Kingdom Hearts Unchained X to be Featured in Famitsu! It's been a short while since we last received news of Kingdom Hearts Unchained X. With Kingdom Hearts X[chi]'s currently ongoing 2nd anniversary event, this seems like the perfect opportunity to reveal some new information! Both the original PC browser game as well as it's upcoming mobile counterpart will be featured in this week's issue of Famitsu Weekly. 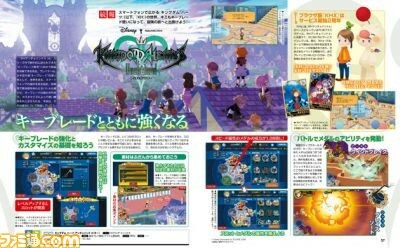 The segment on Unchained X shows off a brand new illustration of Keyblade wielders atop the Daybreak Town rooftops, and will go into detail about the changes to gameplay being made to the game, such as Keyblade customization and medals replacing cards. They will also talk about X[chi]'s 2nd anniversary event, the first part of which is already well underway! For all you current players, Kazr10 has created a full in-depth guide covering the event, so be sure to check it out! Scans and translations will be available as soon as possible. Ooh, it will be interesting to see how the story of X(chi) develops. I presume the tower that is seen in the rooftop picture is the same Ephemera and the player were climbing up? It makes me wonder what is at the top of it. Maybe there is the room where the Foretellers were discussing with the mysterious Org XIII coat person. Crossing my fingers and hoping this means a release date or something. Because seriously, this game needs to be outs already. I wants me some KH mobile action. I'm honestly surprised that the game isn't out already. I was under the impression that Unchained X would be out by this summer or something. When I was waiting for the Square Enix conference to start and I saw the image of Chi with the other games, my hopes were up with the game being released soon like Fallout Shelter. I wonder if they will release by August or so. That's really strange. What exactly is the problem you're having? The article will be issued on 6th August. Probably to include what is going on in the current anniversary. The image in the OP contains the information that we already know about.